I can’t show you any photos of the kitchen, because work has ground pretty much to a total halt. I blame the fact that I am excessively cheap, and refused to pay someone thousands of dollars to do the painting–including painting the cabinets. Which means I haven’t finished doing that job, and we’re living in a kitchen with drawers that don’t have handles, cabinets that don’t have doors, and painter’s tape under most of the appliances. So you don’t get to see all that, at least, not until it IS done and I can show you “After” photos and feel better about myself. What you CAN see, though, is the kitchen table! I’ve been painting–and I swear, I did a coat of primer on the inside of the cabinet doors, too, so we’re getting closer on that one, honest–and it will be transformative. Once it’s done. But for now: the kitchen table! 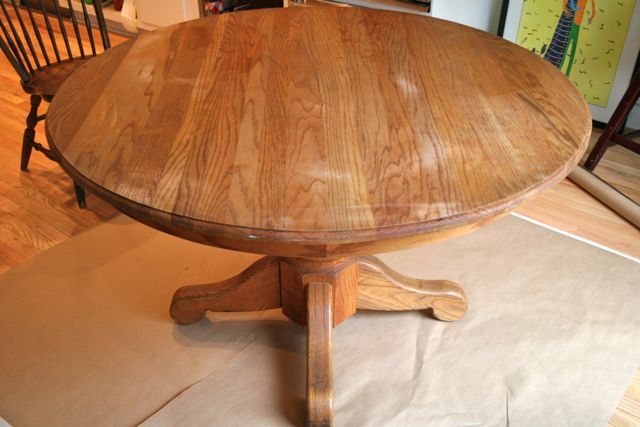 This was an oak pedestal table that my mom gave me–it belonged to my step-father’s mother, who is no longer with us, and Mimi would have loved knowing it’s going to get painted and banged up and crafted all over and loved on by babies. That was totally her thing. Solid coat of primer to start–I used Zinsser’s oil base, since I was less than thrilled with the performance of the Kilz I used for another project. This is the same primer I’m using for the kitchen cabinet doors. 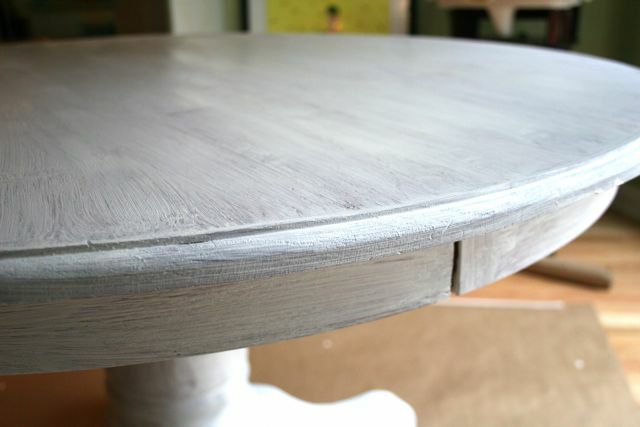 It’s not important to have a super thick coat, or to paint it so well that you can’t see any of the original wood color or grain coming through–just that you get enough on that the paint has something to stick to. I prefaced this by scrubbing the wood to get it clean, but didn’t sand, since the oak wasn’t at all smooth. 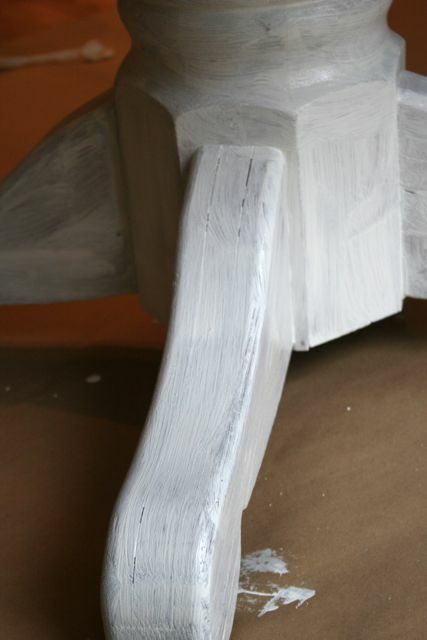 Takes about an hour for the primer to dry before it can be re-coated. Already, huge difference. 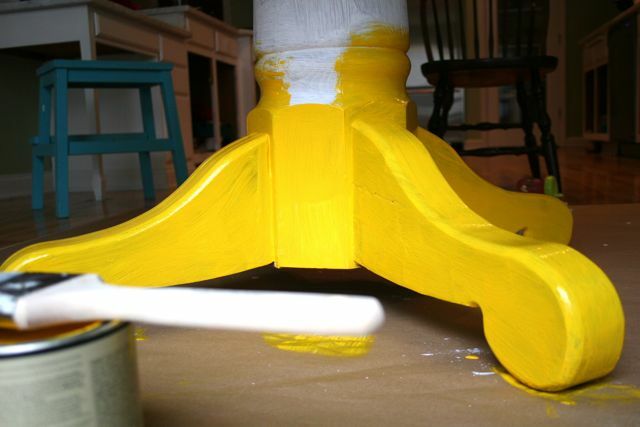 Then it was time to bust out the high-gloss paint: Whipstitch yellow. My signature accent color, and I think a perfect complement to the calm green we have going on all the walls in our “public” rooms in this house (which are almost exactly the same shade as the blog background, although I swear that was completely subconscious). With the added advantage that both the green and the yellow are solid mid-century colors with a brisk modern appeal. I knew instantly that this would be the color of this table, but I hemmed and hawed for a bit after we put it in the kitchen. I was worried that my red stand mixer would read “ketchup and mustard” next to the table. I still am, but all the other colors I toyed with (a lovely aubergine plummy color, a deep peacock, a bright white) just didn’t have the presence and simultaneous spring-y cheerfulness as this yellow. I do love it so. As soon as it began to go on, I knew I’d made the right choice. 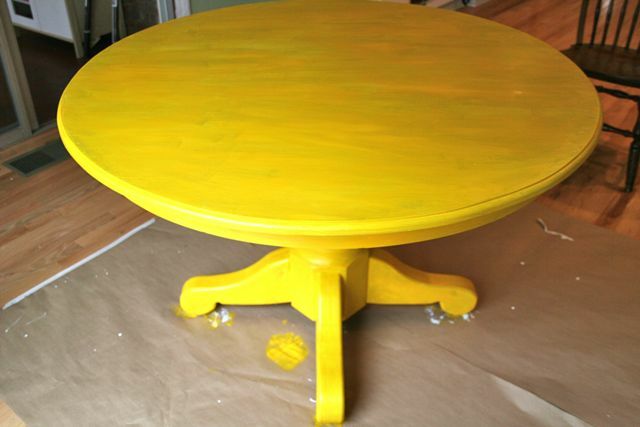 Even though there isn’t very good coverage here, you can tell how fulfilling this color will be, as if this table waited its whole life to be bright yellow. So here we are after one coat. Because what I really need is another half-finished project. But really, the label says I have to let it dry OVERNIGHT before I can re-coat. Which is ridiculous, and totally pooped on my plan to surprise my husband with a finished project when we gets back from work tonight. Alas, c’est la vie. I’ll do another coat tomorrow, and maybe a third if I’m feeling frisky. So far, though, half-finished or not, I think it’s PERFECT. Now I just have to find a single perfect Whipstitch-yellow accessory for every room in the house. I’m wondering if I can get away with making the drapes in the front living room this color. Who bets I can? For your accessories… one word: Fiestaware. I don’t know if they have something the eaxct smae color, but you might be able to find something darn close! The Homer Laughlin site probably has a much larger selection than your average retailer. I heard wonders about this primer….just waiting to find it too and give painting a try! Hi. Love the table. 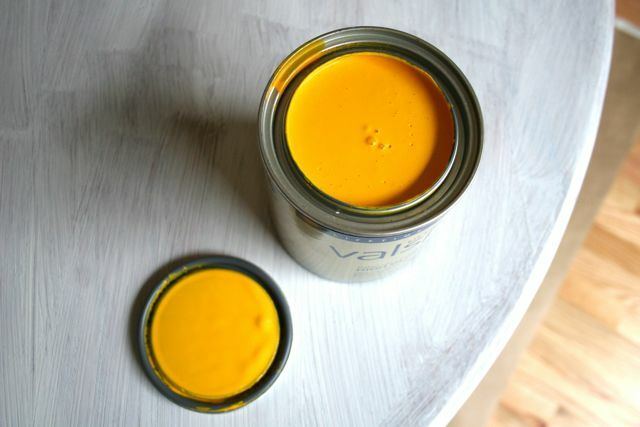 Can you tell me the name of the Valspar paint that you used? I figured it would just be called Whipstitch Yellow, but I was wrong. Thanks! !